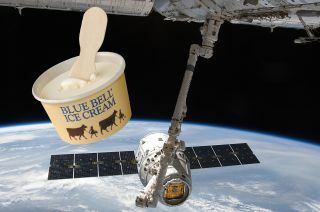 Ice cream is launching on board SpaceX's Dragon spacecraft on NASA's first contracted resupply flight to the space station in October 2012. Ice cream is blasting off for the crew of the International Space Station (ISS). The frozen confectionery — not the freeze-dried souvenir version sold in museum gift shops — is packed on board the first NASA-contracted commercial mission to resupply the orbiting laboratory. The ice cream, which is now a not-so-secret surprise for the station's current three member crew, was confirmed as on board SpaceX's Dragon cargo capsule by NASA after a pre-launch press conference Saturday (Oct. 6) raised the possibility that it was included. The GLACIER, or General Laboratory Active Cryogenic ISS Experiment Refrigerator, is primarily used to preserve science samples that require temperatures between minus 301 and 39 degrees Fahrenheit (minus 160 and 4 degrees Celsius) on the way to or from the space station. The mini-fridge sized freezer previously flew aboard the space shuttle.